I go treasure hunting on the beach at low tide, even when I should be doing other things. The tide calls and I respond, leaving unwashed dishes or half-written paragraphs. We live according to the tide here in El Matal, a quiet fishing village on the coast of Ecuador. At this particular spot at the equator--directly east from the Galapagos Islands-- the warm tropical current from north meets a colder current from the south to create a rich bonanza for fishermen and shell seekers alike. But as serendipity would have it, we shell seekers often find even more beguiling treasures. Small, mineral rich rocks in variegated colors and designs wash up on the beach alongside giant conch shells and smooth driftwood. I stuff my pockets with what I can carry, pebbles and small rocks--red, orange, green, even pure crystal--until I am so weighed down I can hardly walk home. But I revel in each find like a child on an Easter egg hunt, plucking up the colorful little gems before the sea reclaims them. It's as if a Primordial Artist is sculpting away deep under the sea, tossing up imaginative, wholly original creations for the lucky treasure-seekers on shore. ​Why are we so drawn to rocks? Perhaps we are wired that way. Carl Jung viewed rocks as one of the primordial symbols of eternity. He said that each of us has inherited this ancient human tendency toward seeing--or rather,feeling--the sacredness in rocks. Primitive human beings believed that rocks were filled with gods and spirits. This is the where we get the idea of piling rocks on graves or creating tombstones, which were once believed to contain the spirit of the loved one. In the same way, the earliest sculptors sought to "free the spirit" within the stone. Whitehead, Buddhism, and quantum physics all agree (using their own language) that rocks are, in their essence, aggregates of vibrant energy rather than inert lumps of matter. As science pushes us forward, far beyond Newtonian physics and Cartesian dualism, it also circles back to something ancient and mysterious and primal. We can now appreciate with fresh eyes the "superstitions" of the ancients who felt a sense of "mystical participation" with nature. In this vein, process theologian David Griffin sees postmodernity as a time for the "re-enchantment" of nature. We can begin the re-enchantment process with something as simple as a rock. The energy of rocks is particularly mysterious and primordial. I love to pick up a small rock from the wet sand and feel its warmth in my hand, even on chilly, sweatshirt days when the clouds hang low and the the volcanic sand cools my feet. A rock holds the energy of the sun long after everything around it succumbs to darkness and chill. The warm energy of the rock feels as if it were a living thing. And, in a sense, it is. And its “life” radiates a personality of something strong and trustworthy—and forever present in the world, remaining long after we are gone. The rock is very sure of itself, of its past and its future. And it has reason to be. When we pick up a rock, we are not just holding a lump of minerals: we are holding a piece of eternity in our hands. This deep symbolism of rocks sustains us, especially during grief. My husband and I recently lost a good friend, a bright and shining soul still in his prime. After hearing this news, I walked along the shore, feeling the intrepid tide pulling the sand out from under my feet, feeling as if the world were nothing but shifting sand. But then I turned my attention to the scattered rocks left behind on shore and they seemed to have another message. In the midst of perpetual perishing, there are solid things too, such as eternity and God's eternal care. A single rock can comfort. I found that day a special rock that seemed somehow to speak, to connect, to symbolize something of the spirit of the friend who passed away. Even now, just looking at that rock reminds me not only of the sturdy, steadying character of our friend--a "rock" in our lives--but of his eternal spirit that lives on, both in this world, and in the great mystery beyond. Eternity holds him. Divinity speaks to us through the humble rock, as it takes on "numinosity," a term popularized by Rudolf Otto as meaning "awe-inspiring" or "holy." The word "numinous" was later adopted by Jung to refer to the unusual, heightened modes of awareness brought about by symbols (such as stones). These symbols return us to our most ancient psychic roots. So then, the rock speaks of something more than itself, a symbol of something deep and ancient and eternal. Rocks are healing in that they connect us to something beyond our struggles and mortality. To remind us of this, we might get into the habit of carrying a favorite pebble in our pocket so that, during the vicissitudes of the day, we can reach for it, feel its solid, cool smoothness between our fingers and remember the Deep Eternal. We can also find ways to create art with rocks or arrange rocks in our gardens, especially so that we can water them along with our plants. Water seems to "re-spirit" the rock. 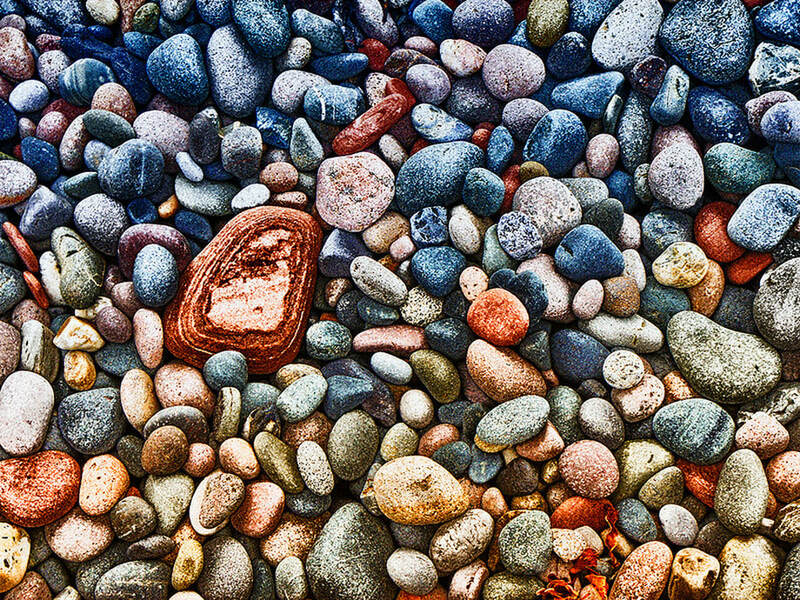 After one of my rock hunts, when I unload my pockets on the porch to examine my treasures, I realize that the very rocks that looked so dazzling and lively when wet with sea water, now look dull when dry. That's why beach rocks are so much more beautiful in situ. When we remove them, which of course we do--who can pass up a gleaming blue pebble?--the rocks lose something of their "spirit." So I put the smaller stones in a glass vase filled with water. The rocks smile back at me with their true colors and dramatic deep veins, and I feel their numinosity once again. The "living" rocks connect me to some deep eternal mystery, to the very divinity within all things. When I ponder the numinosity of rocks, I cannot help but think of God's eternal constancy in the midst of the everflowing movement of life. Yes, Heraclitus, all is flux; yet within that flux, we touch solid ground with the presence of divine love and suffering and creativity inside everything and everyone and every flowing moment. This is the solid side of God: the unwavering eternal love--our "Rock of Ages." And in order to not only know, but to feel the Deep Eternal, we need to allow ourselves a little re-enchantment now and then. To become like children. To be awed by the Primordial Artist beneath the sea, who is always there, forever tossing up pieces of eternity for those who seek after deep things. Patricia Adams Farmer is an essayist and novelist in the tradition of process theology. She is the author of Embracing a Beautiful God and the Fat Soul Philosophy Novel Series (The Metaphor Maker and Fat Soul Fridays). She and her husband, Ron Farmer, live and write on the north central coast of Ecuador. Visit her website at patriciaadamsfarmer.com.